Simon Carr: By the way, Kleinman, I ran into Mr. Paulson before. He's giving me the promotion. Max Kleinman: He said that? Simon Carr: Actually, he said that he sees you as a kind of cringing, slimy vermin more suited to extermination than life on this planet. I don't think he means it personally. Woody Allen reaches into his own deep well of nightmares to bring us the vague and disquieting confusion of Shadows and Fog. An assemblage of literary and cinematic allusions intensifies the ominous surroundings, offset by humorous spots of familiarity (in the form of some standard Woody-isms) that serve to anchor us, if only momentarily, before disappearing into the fog again. But beware: this is more an allegory for Kristal Nacht than a comedy. A thuggish band of vigilantes rouse Max Kleinman (Allen) from his warm bed in the middle of the night and insist he participate in their plan to catch a "Jack the Ripper"-type killer on the loose in the city. Kleinman, still sleepy and befuddled, is unaware that this is but the beginning of a long, strange night. He dresses and hurries outside to meet the posse, but the streets are deserted. Meanwhile, in a nearby circus caravan, a clown (Malkovich) and his sword-swallowing girlfriend, Irmy (Farrow) quarrel, and Irmy takes off into the night. A murder or two later, Kleinman meets Irmy and they have various encounters with a host of people who move in and out of the shadows, as they, too, part and meet again and again in this murky gloom. Allen succeeds in creating an ambience of paranoia and suspense by setting his story in an undefined time in an unnamed city that, at times, seems like a village and then something like the London of Arthur Conan Doyle. The damp darkness becomes almost tactile: the longer I watched the more the chill seemed to seep under my skin, and the deceptively merry score, consisting mainly of Kurt Weill songs, facilitated this sensation. He costumes certain characters as European villagers while others don fedoras and heavy overcoats, reminiscent of the 1930s. Conspicuous reference to German Expressionist cinema (M, Nosferatu) and Universal's horror classics are interposed to construct a surreal portrait of uncertainty and doom. But this is, after all, Woody Allen, and he does interject the right amount of humor to counterbalance any amount of suspense he builds. As usual, he plays the nebbish (his character's name, Max Kleinman, can more or less be translated to mean "your ultimate average schlemiel"), and delivers the expected intellectual banter - this time in the town's licensed brothel, it comes as the wisdom of its denizens. Still, this is no comedy, and his innocuous thriller is riddled with subtle - and not so subtle - references to the subversive, anti-Semitic activities of the era that led up to Kristal Nacht. The vigilantes disagree over how to execute "the plan," and break down into contentious factions as the hunt for the lumbering killer continues through the night. Kleinman remarks, "Soon we'll be doing the killing for him." As the fog thickens and the shadows darken with accusations and suspicions, the disputing sides indeed begin to murder each other. The casting is remarkable - every face is a recognizable character actor or star, down to the smallest cameo roles - as are most of the performances: Donald Pleasence as the ill-fated doctor and David Ogden Stiers as the brutish Hacker; Lily Tomlin, Jodie Foster and Kathy Bates as the sagacious "working girls" and John Cusack as their young "regular," with money to burn; Madonna as Marie, the adulterous funambulist; Julie Kavner as the (literally) hysterical ex-fiancée ("Kleinman's here! Here he is! Kleinman's here! Get out and die! Get out and die! You rot in hell you filthy vermin! "); Kenneth Mars, as the Magician who delivers the film's coup de grace...and the list goes on. Oddly, it is the main characters that seem slightly miscast. Malkovich is sturdy, but at times his trademark intensity is a bit too much for the overall feel of the film; however, in the end, he becomes softer than I believe I have ever seen him. He does have a bit of fun as the camera introduces him via an over-the-shoulder shot in a small, round mirror as he removes his greasepaint, recalling the opening scene of Dangerous Liaisons. Farrow is reliable and lovely, but basically unremarkable - the role of Irmy might have been better filled by almost any of the women who were cast in one of the smaller parts. Allen frames this film to fit the era, somewhat constraining himself to the style of the 1930s and mimicking the technological limitations of the period. The camera moves much more here, engaging the viewer more intimately than is usual in his work, including a dizzying 360-degree pan from the center of a table in the brothel while the women dissect relationships. Most scenes seem to be captured in a single shot. 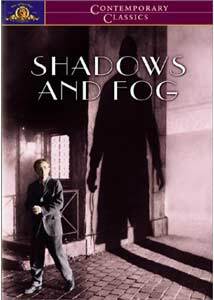 With versatile dialogue supporting a powerful metaphor of dichotomy and paranoia, Shadows and Fog is, at once, suspense and farce, illusion and reality...and 100% Woody Allen. Image Transfer Review: Fulfilling the description of "shadows and fog," the image is intentionally soft and gloomy, with no true blacks or white, which is as the filmmaker intended. The ambience created in the original has all the clarity necessary; MGM has done a fine job on this transfer without interfering with this intention. Absolutely clean of any debris, marks or obvious digital enhancements, this is one of the best transfers I have seen to date. Audio Transfer Review: The original Dolby mono track is as clean as the image transfer. Strictly dialogue and supporting score, it suits and even adds to the 1930s' feel of the film. Allen's choice of music is, as ever, superb. MGM also provides DD mono tracks in French and Spanish, worth at least a brief listen to hear Woody's distinctive stammer translated by the voice actors; the Spanish voice is actually an exceptional impersonation. Extras Review: Black-outlined, yellow subtitles in French and Spanish overlay the image, which should please the 16:9 TV crowd. Again, I slap MGM on the wrist for relying on our televisions' built-in closed-captioning function and not providing English subtitles. Cut it out (as they have promised to do later this year). The original trailer is in 1.85:1 and as clean as the feature. A single-fold booklet with production notes is included, but someone needs a spellchecker. Completely unexpected, Shadows and Fog is high on my list of favorite Woody Allen films. Whether enjoyed as farce or dissected further for its philosophical entendres, this one should be on your list, too.